We had the selection meeting for the Winter issue on the 23rd. We selected lots of pretty things. I dragged up all of the yarn balls and yarn for the goody bags. This was my second trip. 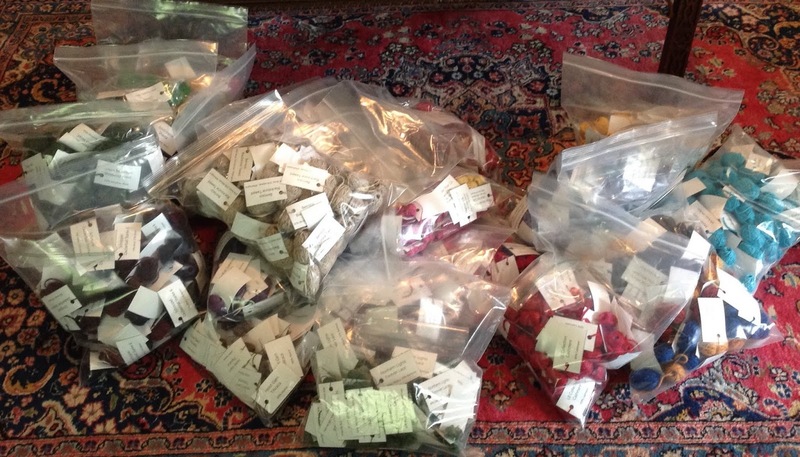 It looks like we will have 37 different yarns at the tasting. It continues to be a slow week. I only have had three lessons to review since my last post. This has given me time to prepare for the conference which is good news. I spent part of the week working on the MiniCourses which will be available on July 1st. We will be adding to the curriculum every six months. This week's tip was a special request. I have done a video on how to seam a horizontal edge to a vertical edge but the sample I used was stockinette stitch. I've had a request for garter to garter. Anytime you want to seam a bound off edge to a selvedge edge you have to deal with the difference between row and stitch gauge. There are more rows to an inch than stitches and you must make use some sort of ratio to compensate. What I have found works with garter stitch (if there are not wide gutters between the ridges) is that you can pretty much seam one bound off stitch to one ridge. I used some of the homework swatches for my finishing course to try this out. When you bind off garter stitch you have a choice. You can bind off knitwise or purlwise. The two sides look different. Generally it doesn't make a difference which is the RS or WS but if you are going to seam the edge, you would want the purlwise side to be the RS. If you look at the photo below, notice that the top row doesn't look too great. Compare it to the photo below which looks better. I think this one looks lots better. If the piece you are seaming has a definite RS/WS, be sure to bind off so that the purlwise side is the RS. This means you either bind off purlwise on that side OR you bind off knitwise on the WS. Here are the seams in process. Here is the one where I bound off using the purlwise side. Here is the one where I bound off using the knitwise side. Salon will be on Sunday (June 28) from 1:30-3:20. My Finishing Class, both Days 1 and 2 are sold out with 22 students. I decided sort of at the last minute that I can take 3 more students for each class. Tickets will be available at only on site. Since any potential student would not have time to do the homework I decided to make 3 sets. I do charge for this as it is a major pain. That is what my current project is...finishing the homework. I feel the pain of my students. There is a TON of homework. Yarn will be arriving soon for my Cast On projects...a man's sweater with a shawl collar, an asymmetrical jacket, a poncho and a hat/boot topper set (confident beginner). What was I thinking?